We would like to invite you to test and evaluate our products! You can download the installers from our download page. After installing, you will need to use the beDSP License Manager from your application folder, to request a free trial. The trial version is fully functional for 30 days after activation. We believe that your feedback and expertise are very important for us. If you are interested in spending more time with our products, please use this contact form to send us a request and we will offer you FREE NFRs (use “NFR for press” as subject). For evaluating the C-Normalizer please download a trial version of Harmonic ProMedia Carbon Coder and contact us directly to obtain a trial or a NFR license. 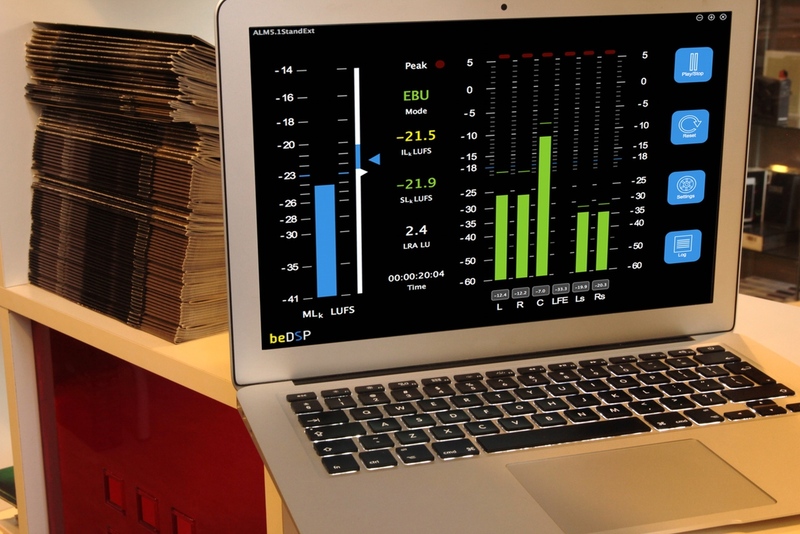 The beDSP products are focused on a very important issue right now – Loudness measurements and Audio Loudness Normalization, based on the latest ITU BS1770 and EBU R128 standards and recommendations. ALM 5.1 is a loudness and true peak meter compatible with BS1770, ATSC A85 and EBU R128 standards. It’s available as VST, AU, AAX plugin and also as a standalone application, which allows you to route and matrix audio from in to out. For complete details, please visit the ALM 5.1 products page. ALMx 5.1 is a standalone loudness and true peak metering application, with extended features. One of the most important component is the automated logging with graphic representation of the short term loudness. Also, ALMx5.1 provides you lots of useful information regarding the measured program and remote control, using ethernet. This allows the user to view the meters in real time, from another device. For this purpose, an iPad application will be available soon and also standalone versions for PC and Mac. For complete details please visit the ALMx5.1 products page. C-Normalizer is a plugin for Harmonic ProMedia Carbon Coder (a transcoding application used in the broadcast industry). The plugin can measure and normalize audio content to the specified target levels. It also creates a very useful and easy to read log file. The plugin has a special feature: it can process audio in groups of 8 channels independently configured. This is a very useful option for the broadcasters that want to process multiple languages for the same program. For complete details please visit the C-Normalizer products page. The National Audiovisual Council of Romania adopted on the 18th of June 2013, in public meeting, the recommendation regarding the loudness levels in broadcasted programs. The recommendation was issued following the loudness irregularities within programs, within programs of the same channel and between different radio and television channels, which triggered numerous complaints from listeners and viewers. The National Audiovisual Council of Romania approved the recommendation after analyzing the different technical aspects involved in the broadcasting process of audiovisual programs under Romanian jurisdiction and after debating this matters within the meetings of the LOUDNESS Working Group. The document is in line with the experience accumulated by different European states which put into practice the Recommendation EBU R128 – 2011 on „Loudness normalization and permitted maximum level of audio signals” adopted by the European Broadcasting Union (EBU). The Council established a common measurement reference in order to preserve the original sound and its artistic value. At the same time, the technical equipment needed by the radio and TV stations is taken into account. The recommendation’s purpose is to assure the loudness normalization of the broadcasted programs by setting a measuring standard, in order to preserve the initial/original sound and his artistic value. PROTV, member of Central European Media Enterprises and the most viewed channel in Romania, chooses to implement the C-Normalizer plug-in, offered by BeDSP, in order to normalize the loudness levels of its broadcasted programs and aligning them to the EBU R128 specifications. The decision comes shortly after the National Audiovisual Council of Romania (CNA) adopted the Recommendation EBU R128 regarding the loudness levels in broadcasted programs. In June 2013, the CNA recommended that the broadcasters and the program services providers under Romanian jurisdiction should annually recalibrate the transmitted alignment level according to the EBU’s and ITU’s norms. By choosing the beDSP solution, PRO TV now has integrated in his workflow a precise normalization and True Peak Limiter tool, which guarantees no loss in audio quality. At the same time, PRO TV shows respect for his viewers, allowing them to watch their favorite programs without worrying about loudness irregularities that may occur.